Our 117 Best Pope Francis Quotes covers a range of topics including the importance of family, mercy and charity. Pope Jorge Mario Bergoglio (Pope Francis) hails from Argentina. He lives in an apartment and cooks his own suppers. He was elected Supreme Pontiff on March 13, 2013. 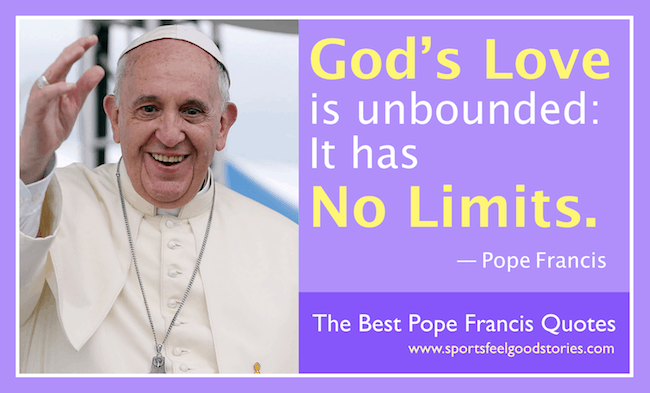 Learn more about Pope Francis and The Holy See at the official site. Enjoy. Jesus is the gate opening up to salvation, a gate open to everyone. God’s forgiveness is stronger than any sin. Those who do not believe in or search for God have perhaps never been challenged by a testimony of faith. • There are many excuses (to justify why one does not give money when asked by a person begging on the street, some may think), I give money and he just spends it on a glass of wine! A glass of wine is his only happiness in life! (Giving to those in need) is always right… tossing money and not looking in (their) eyes is not a Christian (way of behaving). • In the shoes of the other, we learn to have a great capacity for understanding, for getting to know difficult situations. • …because a Church without the Eucharist doesn’t have strength – the Church makes the Eucharist, but the Eucharist also makes the Church. • Fears close doors, freedom opens them, and even when [the space for] liberty is small, it opens a window. • I am a sinner and I am fallible. • We must not forget that the idealization of a person is always a subliminal kind of aggression…When I am idealized, I feel attacked. • Lent is a new beginning, a path leading to the certain goal of Easter, Christ’s victory over death. • Fasting is not only about abstaining from food. It also means sharing food with those who are hungry. • Lent urgently calls us to conversion. We are called to return to God with all our heart. The tenderness of God is present in the lives of all those who attend the sick and understand their needs, with eyes full of love. Hope opens new horizons and enables us to dream of what is not even imaginable. Let us be close to our brothers and sisters who are going through illness and also their families. I encourage all of you to see in Mary, Health of the Infirm, the sure sign of God’s love for every human being. Hope lets new life blossom, like a plant that grows from the seed fallen on the earth. Let us never forget to pray for each another. Prayer is our greatest strength. The Kingdom of God is already in our midst like a hidden seed. Anyone with pure eyes can see it blossom. Take action! Live life to the full! And when others see the witness you give, they may ask: why do you live this way? Let us never place conditions on God! Entrusting ourselves to the Lord means entering into his plans without demanding anything. It is the disease of cowards, who do not have the courage to speak upfront and so talk behind one’s back. Watch out against the terrorism of gossip! Are you angry with someone? Pray for that person. That is what Christian love is. A person who is not convinced, enthusiastic, certain and in love, will convince nobody. God can fill our hearts with his love and help us continue our journey together towards the land of freedom and life. Being Christian involves joining one’s own life, in all its aspects, to the person of Jesus and, through Him, to the Father. The Lord asks us to be men and women who radiate the truth, beauty and the life-changing power of the Gospel. Every time we give in to selfishness and say ‘No’ to God, we spoil his loving plan for us. I say that politics is the most important of the civil activities and has its own field of action, which is not that of religion. Political institutions are secular by definition and operate in independent spheres. All my predecessors have said the same thing, for many years at least, albeit with different accents. I believe that Catholics involved in politics carry the values of their religion within them, but have the mature awareness and expertise to implement them. The Church will never go beyond its task of expressing and disseminating its values, at least as long as I’m here. Let us ask the Lord for the grace not to speak badly of others, not to criticize, not to gossip, but rather to love everyone. This generation, and many others, have been led to believe that the devil is a myth, a figure, an idea, the idea of evil… But the devil exists and we must fight against him. Dear young people, let us not be satisfied with a mediocre life. Be amazed by what is true and beautiful, what is of God! Hatred is not to be carried in the name of God. However dark things are, goodness always re-emerges and spreads. Each day in our world beauty is born anew. We cannot be Christians part-time. If Christ is at the center of our lives, he is present in all that we do. There is no cross, big or small, in our life which the Lord does not share with us. Mission is at once a passion for Jesus and a passion for his people. Indifference towards those in need is not acceptable for a Christian. If someone is gay and is searching for the Lord and has good will, then who am I to judge him? The problem is not having this tendency, no, we must be brothers and sisters to one another. 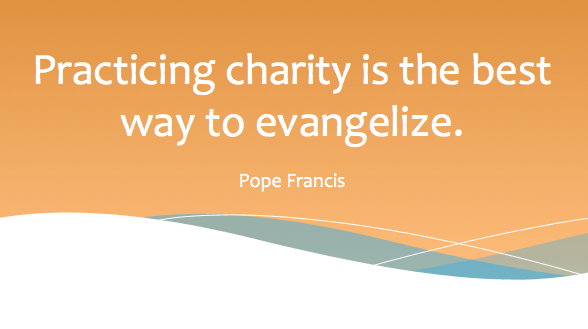 If you have other Pope Francis Quotes you’d like to suggest, please use the Contact Us page. Thanks!